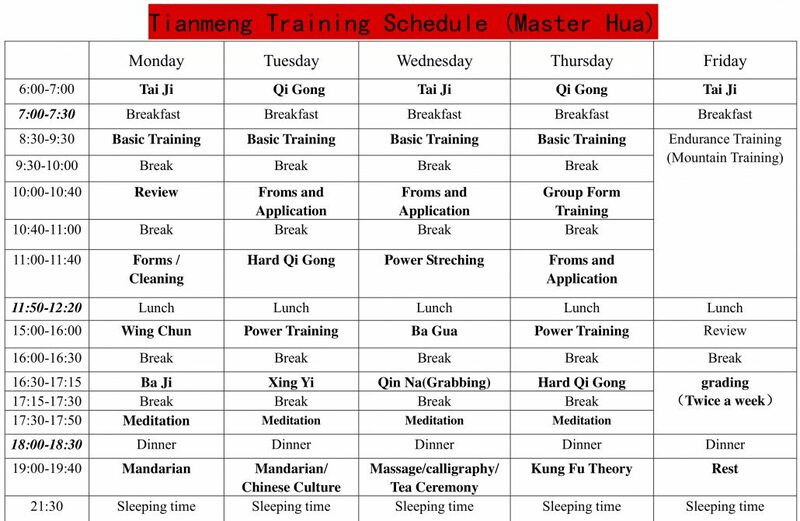 The training schedule covers the external and internal styles of Kung Fu. In every Kung Fu style, there is Yin and Yang and each practitioner has to find a balance in his training. The below two schedules are example schedules of training provided by our current two Masters, however, both are subject to seasonal change. 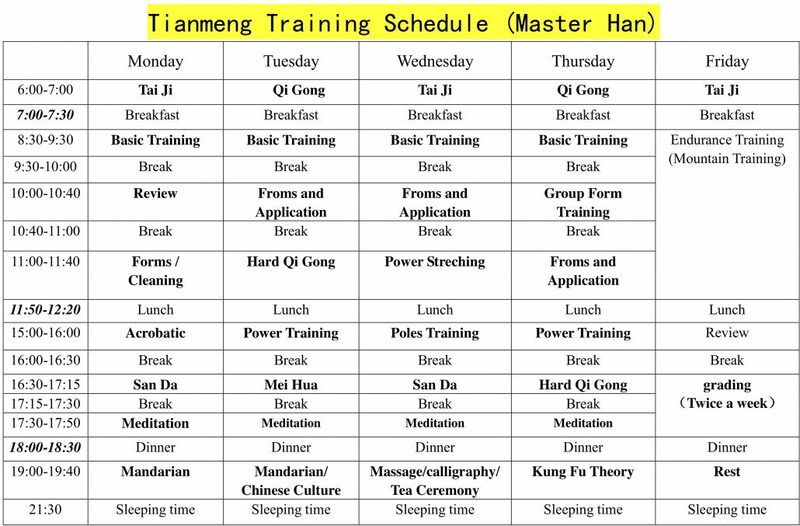 The styles included in the schedules below are Shaolin Quan, Wing Chun, Meihua Quan, Sanda, Tai Chi, Hard & Soft Qi Gong, Bagua Zhang, Xingyi Quan, Baji, Wudang Kung Fu and Animal Styles (e.g. Mantis). If discussed in advance with the masters we are happy to adjust the schedule, be it due to health issues/constraints of the student, or a passion for focusing and learning only one style. For thousands of years’ Chinese ancestors have discovered the secret to a long and healthy life and passed this down from master to disciple. The fundamental principle of life cultivation is to develop universal harmony by using a balanced approach. The human body should be in perfect balance of intake and outflow, activity and rest, sleep and wakefulness. Basic knowledge of Chinese Culture and Chinese Kung Fu. Fundamental kicks, steps and sweeps, punches, palms, hand shapes. Authentic health care Qigong, hard Qigong, low and high Meihua Poles training. Flexibility training, stability training and endurance training. Babu Lianhuan Quan, and their applications. 24 Yang style Taichi form. In this time, you can manage to get a general idea of what Chinese Kung Fu is like and learn the methods to practice some Chinese Kung Fu styles. More Chinese Kungfu theory (to reach a more complete understanding of Chinese Kungfu). More authentic traditional health care Qigong, hard Qigong, low and high Meihua Poles training. More flexibility training, stability training and endurance training. More forms and Weapons training. One against one without weapon, one against one with staffs. These abilities require: Agility of the movement steps, strength and speed of kicks and punches, accuracy of single moves, coordination of your body and the strength, deeper low and high Meihua Poles training, speed and sprit of Chinese Kung Fu. Chinese Kungfu theory (to a higher understanding of Chinese Kung Fu and Culture). Deep authentic traditional health care Qigong, hard Qigong, low and high Meihua Poles training. Deep flexibility training, stability training and endurance training. Deep forms and Weapons training. Hard Qigong to break bricks in the air, break an iron bar, steel board, and big stone on bean curd(Toufu) without break the bean curd etc. One opposed by many people sparring exercise, one against one with spears, double swords against one spear. This level requires the shape of the hand to be correct, the moving of the body to be quick, the body acting as a whole, the eyes following the moving of the hand, steps moving accurately, spirit to be up and strength to be released at curtain moment with speed. Chinese Kung Fu theory (to a higher understanding of Chinese Kung Fu and Culture); More and deeper authentic traditional health care Qigong, Deeper flexibility training, stability training, endurance training; Advanced traditional Kung Fu forms and skills selected from the famous Shaolin 18 kind of weapons, 72 secret skills, jumping Kung Fu and other Kung Fu styles such as Taichi, Meihua Quan, Sanda. Here are some of the forms: Liuhe long Spear, double swords against spear, three section staff against spear, drunken Staff, drunken Sword, drunken straight Sword, tiger form, crane forms, monkey forms, long rope Whip, Darts, double hooks, double Spears, double whips etc. Chinese Kung Fu is like a vast ocean; the learning is endless. With the optional class, you can choose it on your own and your master will help you to choose something related to your previous practice. Forms at this level need repeated practice, perhaps thousands of times to reach the highest levels of Chinese Kung Fu.